Donald Trump has rejected a slew of accusations of sexual misconduct, telling supporters in Florida they are "totally and absolutely false". The Republican presidential nominee said the women making the allegations were "horrible liars" and the media was colluding with rival Hillary Clinton. 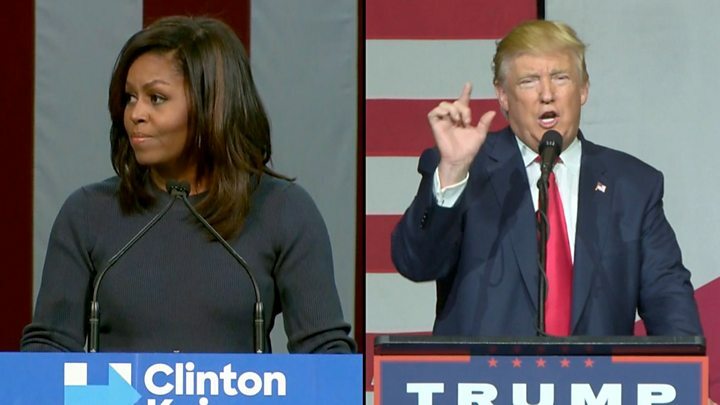 First Lady Michelle Obama earlier said Mr Trump's boasts about groping women were "shocking and demeaning". "Leaders should meet a basic standard of human decency," she said during a campaign appearance in New Hampshire. Seeing Mr Trump make lewd comments about women, on a video leaked last week to the Washington Post, "has shaken me to my core in a way that I cannot have predicted," Mrs Obama said, her voice cracking with emotion. What are the claims against Trump? And it was to this backdrop, the First Lady expressed her revulsion at Donald Trump's comments about women, as heard on that recently released tape. She spoke with emotion, energy, and from the heart, but didn't name Mr Trump once - referring to him instead, as the candidate. But aside from expressing her distaste at the Republican nominee's tone this election- she had another important message to those in the room. That they must vote. Turnout, she said, was key. It's what helped her husband win this state of New Hampshire, and will be crucial for Hillary Clinton too. If Mrs Obama really is a secret weapon for the Clinton campaign, then the true measure of how powerful her sermon was, will be tested in how she manages to rally the Democratic base. A People magazine reporter also said she was forcibly kissed, while another woman said Mr Trump grabbed her bottom. Making his first public appearance since the allegations were made, Mr Trump told a rally in West Palm Beach these stories were "a conspiracy against the American people" by the political and media establishment. He said he had evidence the accusations were unfounded and would release that at the "appropriate time". "Take a look. You take a look. Look at her, look at her words, you tell me what you think. I don't think so, I don't think so." The media, he said, "will seek to destroy your career and your family". Asked during last Sunday's televised presidential debate whether he had kissed or groped women without their consent, Mr Trump said: "No, I have not", and stressed that he respected women. Many of the women said Mr Trump's denial during the second presidential debate prompted them to come forward. Last week's emergence of a video tape in which Mr Trump boasted that his fame meant he could "do anything" to women has sparked a crisis that has engulfed his campaign. 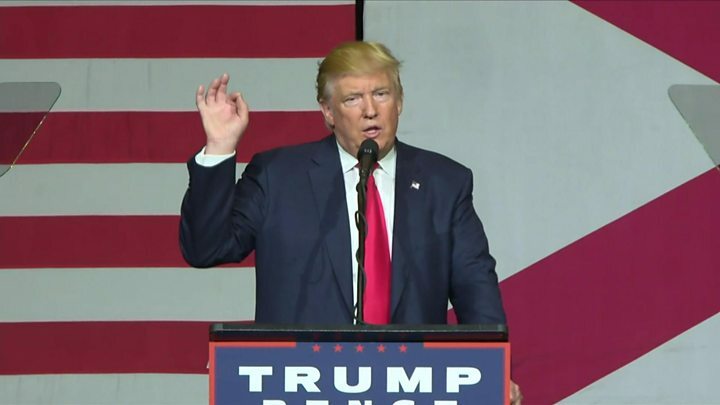 Dozens of Republicans have said they can no longer back him and he has fallen further behind Mrs Clinton in national and state polls. Which Republicans have deserted Trump?